I just installed the May 14th build on my 5d3. But I dont see the 'M' tab in the Magic Lantern Menu. So how am I supposed to enable the raw recording on this build? but I could not load raw_rec! I would like to know this too. I'm getting the same problem on my Mk II. I've looked around, and Couttes posted a link yesterday to fix it with a previous autoexec.bin, but the extreme traffic to the dropbox file cause it to become disabled. I've got the correct modules on my CF card, but I can't access the ability to change my settings to RAW. And "M" tab doesnt appear on my settings. Thanks a lot guys for everything you've done. If there is no M in the menu its not a TCC enabled build. Is that May 14th build? AFAIK the google drive ML link is the latest build. The 5d2 fir is from yesterday. I took the 5D3 ML, and the 5D2 firmware, it all runs perfectly fine, but still missing the tab/ ability to shoot RAW. Try the link posted 3 or so posts ago. It is May 14th build, and it DOES include the M tab which allows you to load the module for raw recording. I just tested it. Seems to work just fine. Devs, I like the addition of it telling me how fast my card must be to write the files(based on the dimensions that I put) nice touch! Seriously man, I cant get it to work. I apply the May 14th build to the CF card, and it all runs fine. I then apply the 5D3 alpha ML to it, and it still runs fine, but still unable to access the module, even though it all exists on the CF card. Whenever I put any other file on it from the 5D3 alpha (5D3-113-bootflag, or autoexec), it temporarily bricks the CF card. I had similar prob. Delete the MAGIC.CFG file in the SETTINGS folder under ML. Put card back and start cam, maybe it will fix it! Yeh thanks, I always just delete all the files, and start afresh. That always fixes it! Thats the one I'm use, but with 5D2 firmware and autoexec from 14th May. Since 5D3 firmware won't work on a Mk II...will it? I been looking through the forums but can't see the compiling codes, I wouldn't mind trying to compile a version for 550D to test out if it workable. Can anyone direct me to the right post with the codes? Or if someone could quickly compile on for 550D i wouldn't mind to test it out. Does anyone have the link to the most updated 5dIII build? DO I need to organize all of these files into how the normal ML firmaware looks? Sraw and then frames like 1280x480 or something like that... a few different ones worked. 960x480 is pretty much continuous. 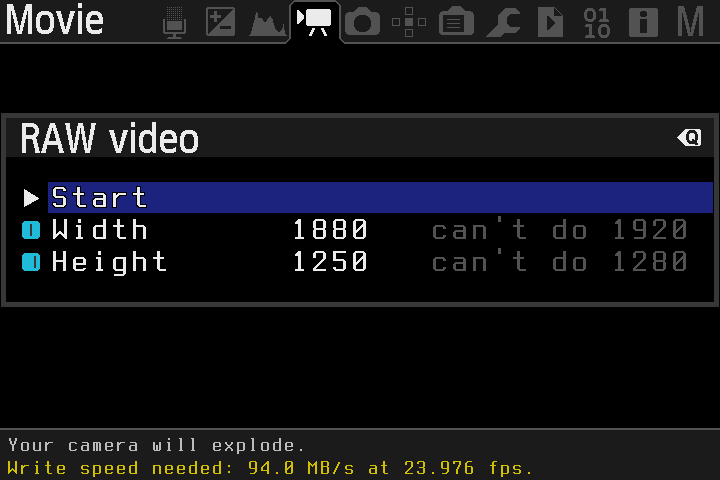 Also recorded in 640x480.. I get a few more MB writing this way up to 18... so shrinking YUV edmacs will have effect... if we figure out how to disable HD buffer and face detection or make it output 1 line only I think there will be noticeable performance improvement. I believe I turned the experimental sraw function on, but still recieved about the same results. My class 10 card isn't very fast (15-18mb in the benchmark) but I still get the partial pink frames on the low 720x320 resolution. It appears to happen slightly less frequently on the lower resolution options, but there is still at least 1 frame of pink junk per second even with continual shooting and no frame drops. Is my card just that much too slow, or could I be missing another important setting? click 'file' at the top and download. I managed to build the nightly for my 5D2 and 1280x720 raw video is as lovely as expected, but it doesn't seem to want to let me record at 1920x1080 or higher. Is this a limitation of the 5D2 versus the newer cameras? I believe that in some cases, it's a card speed limitation. "Can't do resolution X" means a limitation of the current sensor sampling mode. So even if we get the Toshiba 1066x cards, it won't help?